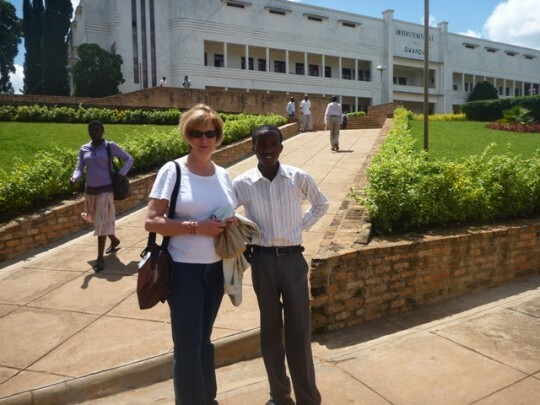 Donna and I were given a tour of the University by Aime Nshizirungu, one of the founders of the Business Club. 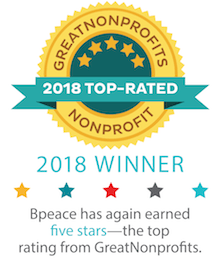 I was so happy that Donna arranged it, She wanted to gain more insight concerning how they found Bpeace, Sweet Dreams, and the idea of their club. Aime heard about the Bpeace Race to Inovation from the Orphans of Rwanda organization that is now connected to all of the former orphans who are now at various Universities. We found out that Richard made an appointment with the head of the organization to make them aware of the Race. Many applicants were University Students. The government of Rwanda is encouraging the students to create new businesses that can provide jobs (doesn't that sound familiar?). They decided to use the same base of students to invite other business owners in Rwanda to provide them with insight concerning why they were not selected as a finalist. They asked: "What could we have done better?" Aime (above in the photo with Donna) found out about Sweet Dreams from the Career Counselor at the University. Nikki from Sweet Dreams, contacted the Counselor about the need for interns for the project. 100 students applied, and our four Race candidates were the ones selected. I guess they learned what they could have done better. For those that were not selected, the counselor sat with each one and pointed out "What they could have done better." This is the theme of the Group. What can I do better? College campuses are college campuses all over. We left the beautiful campus with its park benches, student hall, gymnasium, cafeteria and library.and walked back to Sweet Dreams. The bagels had arrived. They were good, and the women and interns loved them. Of course us "Bagel Experts" from the U.S. had our own opinions, but they tasted great. Over the bagels, Donna and Aime committed to contacting the organizations that the Business Club works with, and their Counselor at the University. I guess Sweet Dreams had its first "mini meeting for business discussions. While Donna and I are touring the university, we're communicating with Fran who is at the Rain Forest in a car that had a flat. Fran, forever the connector, got the name from Simon (the English instructor for Sweet Dreams) of one of the Rangers that he knew at the Rain Forest. So when the car got the flat, Fran knew a Ranger who was able to contact who we are calling AAA services to fix the flat. I don't know what to say at this point!!!!! 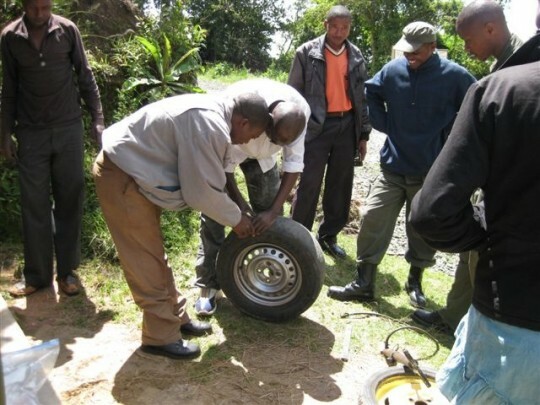 We have decided that there are two parts to this Rwanda Road Trip, one that was structured in its Western structured format training, networking, business opportunities and the other is the Rwandan spirit of community, joy laughter and spontaneity that also becomes business opportunities. They both created the wonderful experience in Butare. Now we have moved to a wonderful hotel in Kigali, and Fran and Donna have just returned from their gorilla trip. Some of the Bpeace Fast Runners are coming to the hotel in a while to take me to dinner, so stay tuned. Wait a minute a truck just pulled up with a business, dropping off someone, let me see what they do?...........Here we go again.